As you strange strange, suggestions. She doesn't even want the food he offers her, so wonder if there was a feed just prior to this ? 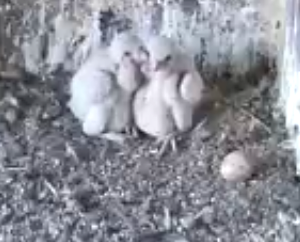 The chicks are not even clambering , and happy to be snugged under Mum. Will you send the vid to Nick D for his comments? Dad acting up again, begging for food even though he at some & then pinching some prey from Mum as she feeds chicks ... looks like she had some left though as she carries on feeding, shame she is blocking our view! How strange I looked in when at the end so missed him messing about. I came in just as he was finishing whatever he had ... would have loved to have seen it from the start! Long time since I captured some footage ... bit of a debacle (again) over food, no sound but I listened & she was literally screaming at him after he'd handed over the quite small prey item which Mum fed to babies! 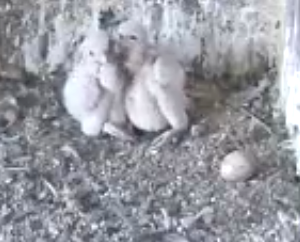 Noticeable chicks' growth spurt albeit being fed with scraps just now! Somebody a bit bored & has excess energy ... makes me laugh to see him wake sibling but don't last long before sleep overtakes! Dad stands guard whilst they play!